The United Nations human rights arm has called for investigations into all acts of violence in Nicaragua, where scores of people – the majority of them students – have been killed in protests that began in mid-April. The Office of the UN High Commissioner for Human Rights (OHCHR), has official requested Nicaraguan authorities to grant it access to the country so that it can gather first-hand information about what happened during the protests, spokesperson Ravina Shamdasani said on Friday. “With demonstrations continuing, including a march that passed off in Managua on Wednesday, we once again call for an investigation into all acts of violence and credible and inclusive national dialogue,” she added. The OHCHR spokesperson also said that the country’s truth commission - established by the Nicaraguan National Assembly to investigate the deaths and allegations of rights violations during the protests - must be independent and able to conduct its work in a transparent and impartial manner. According to reports, at least 47 people, including two police officers and a journalist have been killed in protests, which began as a reaction to social security reforms but widened to include calls for investigations into, and accountability for, the killings; as well as for justice and democracy. In addition to poverty and discrimination, the administration of justice, including juvenile justice, child labour and trafficking remain major human rights concerns in Nicaragua. Indigenous communities and Afro-descendants are among those most affected by poverty, and public services where they live, are run down – including health and educational facilities – in comparison with other areas of the country. 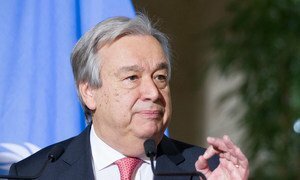 United Nations Secretary-General António Guterres has expressed his concern about the casualties in recent protests in Nicaragua, and called for restraint on all sides.